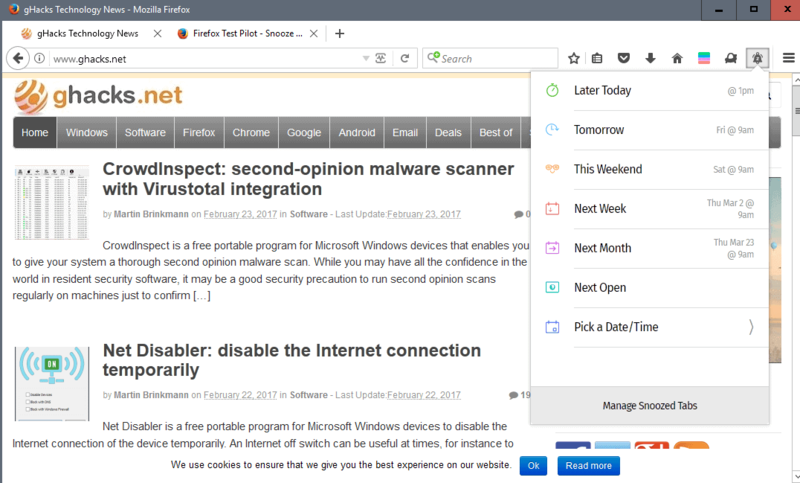 Mozilla launched the two new Firefox Test Pilot experiments Snooze Tabs and Pulse recently for all recent versions of the Firefox web browser. 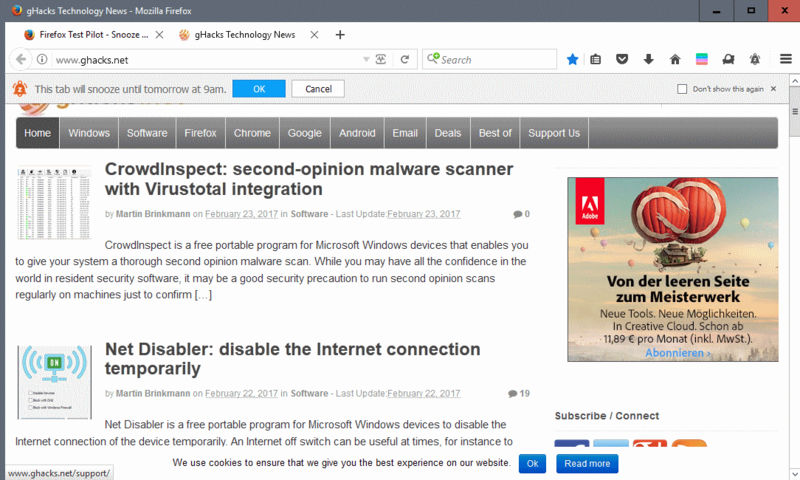 Firefox Test Pilot is a relatively new system that Mozilla uses to gather information about ideas and features that may one day be integrated in the Firefox web browser. The main idea behind each experiment is feedback and demand gathering. Firefox users may install any public experiment to try new features before they may land in Firefox. Not all experiments may make it in the browser however. While those who liked the experiment may dislike that a particular feature is not added to Firefox, it is a better approach than pushing out new features without gathering user feedback at all. Snooze Tabs is the first of the new experiments. It enables you to put tabs to sleep so that it is removed from the Firefox tab bar until it is scheduled to come back. The feature is really simply. Click on the snooze tabs icon when a tab is active that you want to hide for a time period. This opens the scheduler which offers several preset time periods that include "later today", "tomorrow", and "next month". While you may pick one of the periods and be done with the configuration, you may also select to load the tab on the next browser start, or a custom period by selecting a date and time manually. Snooze Tabs displays a confirmation prompt in the Firefox UI that you need to interact with before the tab is removed from the tab bar. You may also cancel the operation at this stage to keep it listed in the tab bar of the browser. What if you want to restore a tab earlier? The manage snoozed tabs button provides you with that functionality. It opens a list of all tabs that are hidden currently, giving you options to restore them right away, or to send them to the trash instead. If you click on a tab there it is opened again, but the snoozed tab remains as well. That's probably what the trash icon is for, as it will remove that site from the managed tabs again. Snooze Tabs offers several interesting options. You may snooze articles that you encounter during a work day until the evening, may snooze a tab like the perfect anniversary gift until shortly before the anniversary, or simply get tabs out of the way that you don't work with all the time while Firefox is open. Snoozed Tabs are restored automatically at the selected date and time. Firefox displays a notification about that, and indicates this as well by changing the icon of the tab for a short period of time. Firefox Pulse gives users of the browser options to report how well -- or not -- a site works in the web browser. Simply click on the Pulse icon -- you find it in the address bar, not next to the other extension icons in the main toolbar -- rate the experience on the site and hit submit. You may leave a comment, and pick one entry from the "this page is" menu which lets you report the page as fast or broken for instance. The core idea behind Pulse is to make Firefox better. Users may report broken sites, sites that don't display correctly in Firefox, or sites that are not fast, and Mozilla may take the data to improve the user experience on these sites by making changes to Firefox. Snooze Tabs and Pulse add useful features to the browser. While I like Snooze Tabs better, the main reason for that is that I barely encounter sites that work badly or not at all in Firefox. The option to report broken pages or services to Mozilla is great, as it may provide Mozilla with a list of sites that don't work well in Firefox that the organization might not be aware of at all otherwise. It remains to be seen whether these two features will find their way into Firefox in this form or another. Now You: What is your initial opinion on these two experiments? Personally, I see no point of snoozing tabs and restoring these on schedule; you can always add desired tabs set to the separated folder on bookmarks bar and open these at anytime or pin them (even easier with Easy App Tabs). 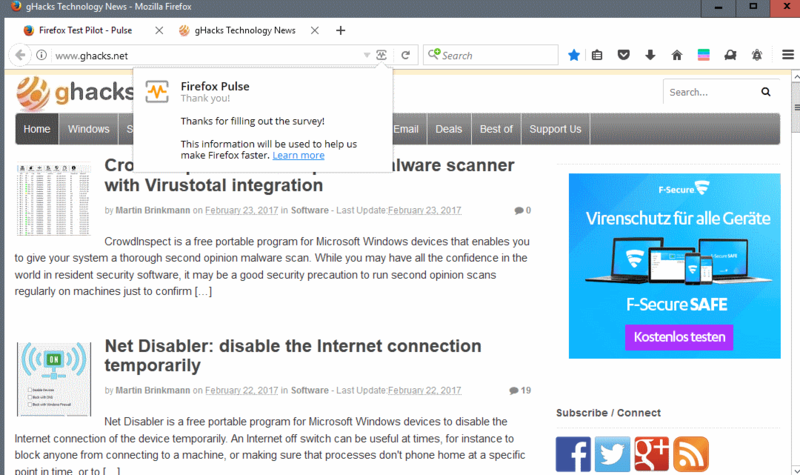 As for Firefox Pulse, it’s also seems to be a pointless extension – sites are working nowadays quite well, Firefox already worked on improving sites that were designed for webkit browsers and ghacks reported itself these works. Hard to tell how it would look like if it would land in Fx as standard feature but my guess is that this rating pop-up would be annoying users each x minutes after site loading is completed. Besides, it gives me feeling that this feature would put users privacy into risk. That’s an option but not really a great option if you always have to add bookmarks for all tabs you want to hide and to delete all these bookmarks at a later point. Snooze Tabs is easier to use for the use case of Snooze Tabs. I know the situation to discover interesting articles but not to have the time to read these articles because I still have more important things to do. So it makes a lot of sense to restore these tabs on schedule. I don’t need this feature very often but it’s nice to have the option. I already use Snooze Tabs since a few weeks (via GitHub). There are more than enough sites not working well, either in general or only in specific browsers. Why is it pointless to report problems? That’s – by far – not the only problem in the real world. > but my guess is that this rating pop-up would be annoying users each x minutes after site loading is completed. You have to click a icon in the address bar to open the interface. That’s not more annoying than every other icon like the icon of the reader mode. > Besides, it gives me feeling that this feature would put users privacy into risk. Please explain how this feature could put users privacy into risk. If a user submits a report the user WANTS exactly that. There is no reporting without explicit user interaction. And there is no surprise – you can read the privacy notes for every experiment *before* you decide to install an experiment. The snooze tabs function looks like it would be of some usefulness for someone. Pulse, not so much: I’ve never seen a site broken on Firefox that worked on some other browser in the last yars. Usually it’s just webdevs messing up. This is nothing new. There have already been two Firefox Add-ons for a long time: Suspend Tab and Auto Unload Tab. Plus, when you restart Firefox, only the active tab loads, the rest being suspended. That is why Firefox is much better than Chrome in RAM usage with multiple tabs. Snooze works differently by closing the tab and reopening it when the snoozed tab needs to wake up. As someone that regularly has more than 80 tabs open due to tab hoarding and not wanting to forget about something, I can see this being useful while closing some unwanted tabs due to clutter. I think an awesome, secondary extension would be an extension that added a “closing tabs opened in the last X minutes/hours/days” function. Regarding the last note, I know Firefox already has the “Forget” function, but that totally nukes the current window session. These two “features” are the definition of bloatware… Has Mozilla really perfected Firefox’s core and has nothing better to do? Please note that those are experiments. It does not mean that they will be included in Firefox in this form, or at all. There’s an existing, popular addon that serves the same sort of purpose as Snooze Tabs. It’s called Tab Groups. There’s only one MASSIVE PROBLEM … Mozilla’s management trolls have killed it … not once, but twice! Mozilla should just put all their resources into Rust, Servo, WebRender etc. They have no clue what to do with Firefox. They need to migrate to a fresh start because modifying Firefox has become a joke. At least with Servo they would not be building a popular product only to butcher it 10 years down the track in the name of, amongst other dubious motivations, removing legacy code. Mozilla could also attract users back to the browser by truly democratizing development. Each feature that can’t be easily abstracted out to an addon could be put to a user vote. That could help rebuild all the user buy-in dubious management choices have butchered. I cram a lot of research into a *very* flexible schedule. I often used to forget why exactly I had bookmarked tabs – it may be several weeks before I returned to a particular tab – and that often led to duplicate bookmarks being created. Now with “Snooze Tabs” I can very quickly get rid of tabs until I have time to deal with them – a feature I find exceptionally helpful and very efficient in use. If I’m busy when they resurface, it takes mere seconds to defer them again. Love it.